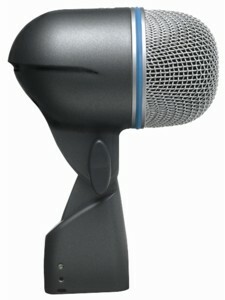 The Shure Beta 52�A is a high output dynamic microphone with a tailored frequency response designed specifically for kick drums and other bass instruments. It provides superb attack and "punch", and delivers studio quality sound even at extremely high sound pressure levels. The Beta 52A features a modified supercardioid pattern throughout its frequency range to insure high gain-before-feedback and excellent rejection of unwanted sound. A built�in dynamic locking stand adapter with an integral XLR connector simplifies installation, particularly if the microphone is to be placed inside a kick drum. The stand adapter keeps the microphone position fixed and resists slipping, even when subjected to sharp blows and strong vibrations. A hardened steel mesh grille protects the Beta 52A from the abuse and wear associated with touring. NOTE: The curve below shows on�axis response at a distance of 2 feet from a uniform sound source. Your response may vary, depending on microphone position.